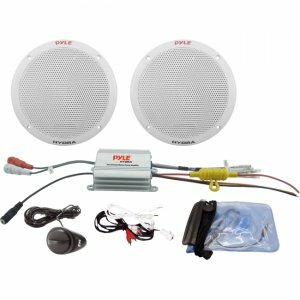 This Pyle marine speaker system has everything you need to blast tunes at sea It comes with a pair of 6.5" two-way speakers, 2-channel waterproof power amp, waterproof iPod/MP3 adaptor, and a waterproof poly bag. The speakers are constructed from high quality polypropylene cones, boasting 200 watts peak power and a white plastic enclosure. The PLMRMP1A amp pushes 200 watts max on each channel, so your speakers are well-matched. The amp also includes an electronic crossover network should you choose to expand your speaker system. The amp takes high and low level inputs, as well as an RCA line level input - so you can hook up your MP3 player using the included MP3 adaptor. And when things get wet, keep it safe in the included waterproof poly bag. Also includes a wired remote control for total control of your music from another spot on your vehicle.